"Rich and savory, a wonderful soup, it can be a meal in itself, serve with garlic toast, its great!" Heat oil in 4-quart Dutch oven over medium heat until hot. Add onion and garlic and cook for 5 minutes or until onion is tender. Add undrained tomatoes, undrained cannellini beans, chicken broth, parsley, basil and pepper to Dutch oven and bring to a boil over high heat, stirring occasionally. Let boil for approximately 1 minute and then let simmer for 10 minutes, covered. Add pasta to Dutch oven and simmer approximately 10 to 12 minutes or until pasta is tender. Serve immediately and enjoy. 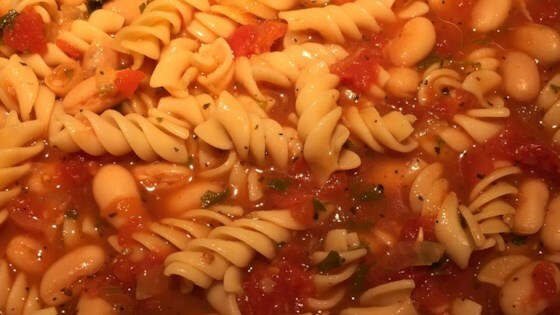 This was too tomato-y for what I would expect from pasta fagioli - it was more like a minestrone. Next time I'll omit a can of tomatoes and add another can of beans. Maybe add some sausage too.